Surrounded by a Mediterranean park landscape, the new Meran Thermal Baths are situated in the heart of the city of Meran. They offer an oasis of relaxation as well as a place of wellbeing with many effervescent attractions for both the local population and South Tyrolean guests. The spa and thermal traditions of the city of Meran are taken up again and newly interpreted in an innovative and pleasant ambience. The core of the thermal architecture is constituted by an imposing glass cube, which seems to remove the border between the interior and the exterior. 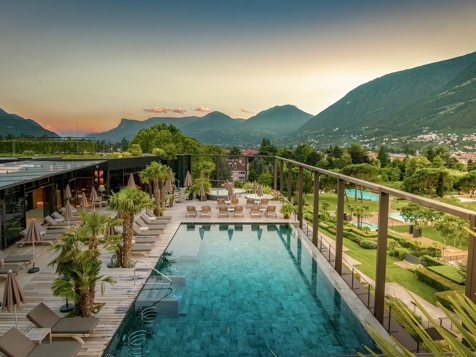 The spa visitors can therefore experience nature very closely thanks to the view of the impressing mountain world around Meran as well as of the Mediterranean park of 51,000 m², where a varied bathing landscape has been built between palms and a water lily lake. 25 indoor and outdoor swimming pools await the visitors of the Meran Thermal Baths with new water experiences. But we also strongly recommend the elegant sauna landscape of 1,250 m² with 8 different saunas and steam baths as well as the fitness center specialised in prevention and fitness checks. A highlight of the Meran Thermal Baths is the so-called Spa & Vital Center of 1,400 m², where natural South Tyrolean raw materials like apples, grapes, herbs and whey are used for unique health and wellbeing treatments. The Meran apple day, the grape oil bath in a vat, the massage with aromatic essential oils from South Tyrol or the South Tyrolean sand bath are only some samples of the delightful variety of treatments.